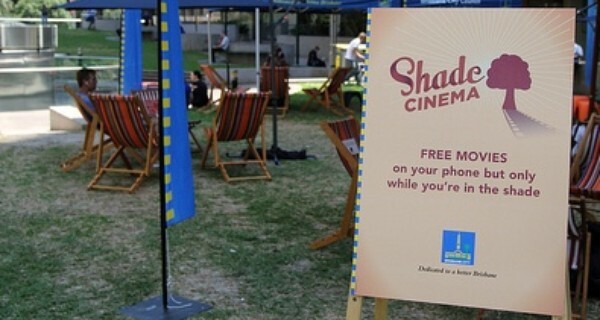 Shade Cinema is a clever tech-enabled behavior change campaign from antipodean public health officials to entice Aussies out of harmful UV rays. Public officials have made almost every shady tree in the city into a wifi hotspot – and created an app loaded with films citizens can watch on their mobile phones for free, so long as they stay out of the sunshine. Brisbane, capital of the ‘sunshine state’ of Queensland, is skin cancer capital of the world. While the 1980s campaign to ‘slip’ on a long-sleeved t-shirt, ‘slop’ on a hat and ‘slap’ on sunscreen, by Queensland’s near neighbouring state, Victoria, was wildly successful in educating Australians, and the world, about the need to limit exposure to UV rays, the incidences of melanoma, the most lethal form of skin cancer, in the country are on the up. Recent evidence suggests that the amount of protection sun lotions provide might be less than originally thought. So Brisbane City Council’s Lord Mayor, Graham Quirk, decided to incentivise his citizenry to come out of the midday sun by turning the city’s parks into alfresco, on-demand multiplexes via the Shade Cinema app and wifi units. The catch is that the films only play in the shade – the app takes a reading of your smartphone’s light registers to show how much sunshine is hitting the screen, with the movie pausing as soon as you step out of the shadows. The project launched in 2013, in New Farm Park, and now runs 24 hours a day, seven days a week, across 22 city council parks.